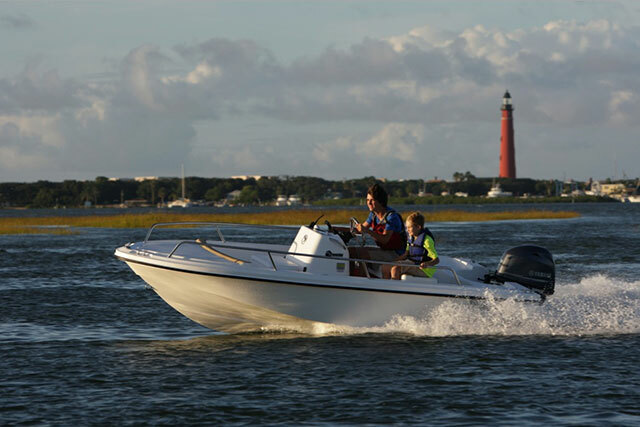 The centre console has a huge following in the USA – especially for sea fishing and owners with a variety of watersports interests. Doug Logan explains why. 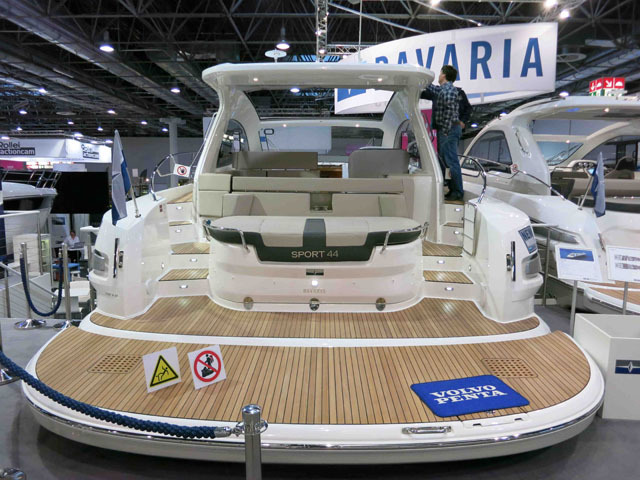 Perfectionists don't make for very happy boat owners – in fact it's pretty rare to meet a happy perfectionist at all. But it's especially important to realise that when you’re trying to find a boat to match your "dream on-water lifestyle" there’s no such thing as perfection. There are only boats that can achieve some percentage — you hope a large percentage — of what you have in mind. 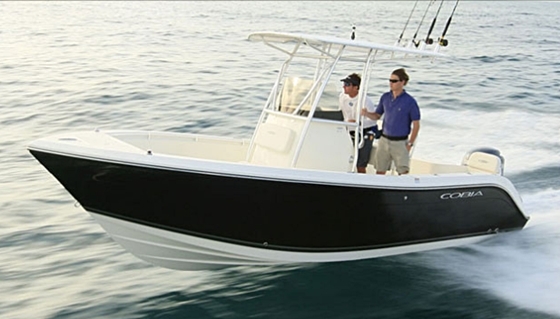 The Cobia 217CC, at 21 feet LOA, is a good example of a small, versatile centre-console. 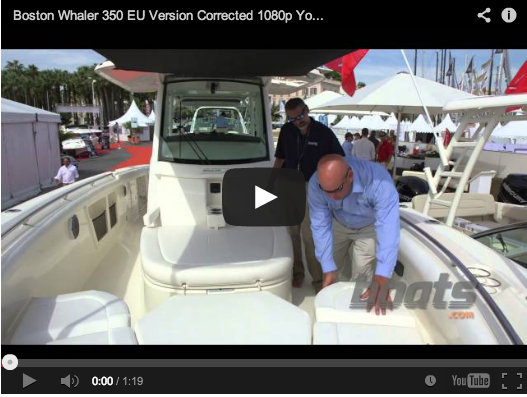 It's powered by a single outboard and rated to 200 hp. Centre-console boats are good at that. They bring a lot of utility to a lot of people. They also deliver generally excellent performance, rough-water ability, and good looks. They can range from fuel-efficient (single-engine, minimal transom deadrise) to ocean-aggressive (double or triple outboards, lots of deadrise). You can load them with fishing gear, wakeboards and tow-tubes—or keep them open and simple. And they’re built by a range of well-established, high-quality manufacturers. But let’s get back to the utility issue, because centre-consoles are like hunting dogs: They’re optimised to do a job, and that’s where they shine. Yes, you can buy a centre-console boat so big that it has room for amenities like bunks, a mini-galley, and even air-conditioning. But a “standard” centre console from, say, 20 to 30 feet long, is an open boat with some weather protection for people clustered near the console behind the windscreen and under the bimini top. Many centre-consoles will have a small head compartment and wet locker inside the console itself, and some minimal seating. The rest of the boat is for doing stuff – usually fishing or pulling someone on skis or on a tube or wakeboard. 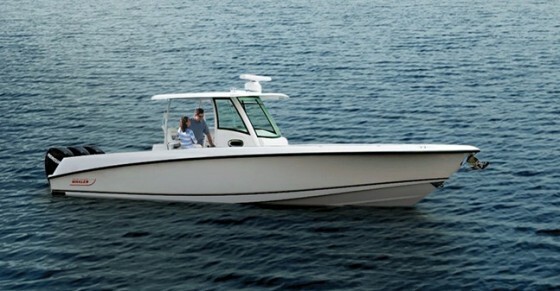 The Boston Whaler 350 Outrage, equipped with triple outboards and rated to 900 hp, is a behemoth centre-console. It's set up as an offshore fishing machine, but also has a stand-up shower and sink, and options for air-conditioning, water-heater and more. As a fishing platform the centre-console is just about ideal. 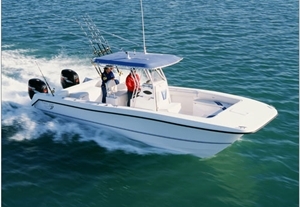 It offers plenty of standing room and open decks for following a fish, open sky for casting, few things to snag lines on, good security in the cockpit, and capability in rough water. 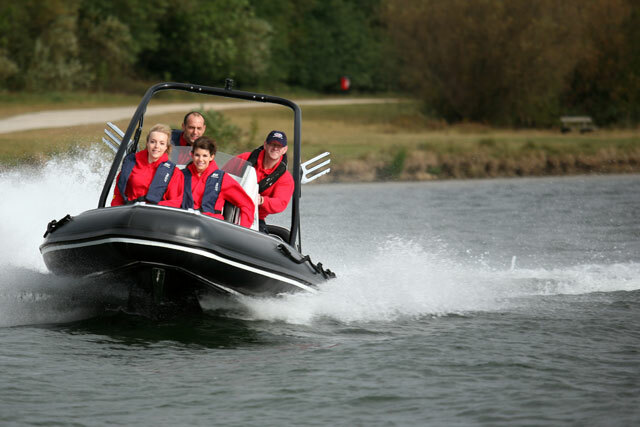 Many of the same qualities make it good as a general-purpose tow-boat — but if you and your family are serious about skiing or wakeboarding, you should look into boats built for the purpose – they’ll have hull forms, engine and drive configurations, wake-making abilities, and on-deck gear built to maximise your enjoyment of those sports. The same is true for scuba diving. A centre-console can get the job done, but dedicated divers will want to look at other options, too. Centre-consoles also come in catamaran form, like this Twin Vee 29 Ocean Cat, powered by twin outboards. 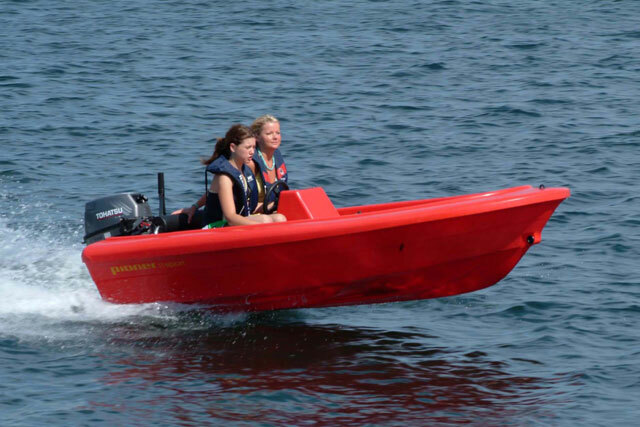 If you have a variety of interests on the water – not just fishing or tow-sports, but cruising, picnicking, gathering with friends, then you’re going to need more protection, more comfortable seating, and better stowage. This is where smaller centre-consoles begin to lose their edge: Few offer much built-in seating, and even that tends to isolate people in remote areas of the boat — two in the bow, two in the stern, and a big console in between. But once you start loading folding chairs and tables into a boat like that, you undercut its strong points. And there’s no room to stow loose furniture anyway. As they increase in size, centre-consoles do begin to offer more amenities – pull-out transom seats, reversible helm seats, U-shaped settees in the bow, etc. And again, the really jumbo models can set you up for a weekend out of your house. 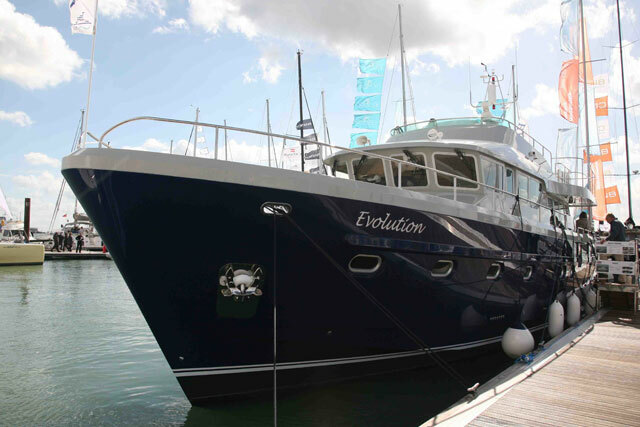 But now we’re talking very serious money and you might do better to spend your money on a sports-cruiser, a small sport-fisherman… or maybe a holiday home equipped with a small centre-console? Did we mention that all boats are compromises? View all reviews and videos of Centre Consoles on www.boats.com – in particular the story of the Mad Mariners: Across the Atlantic on a baking tray, which goes to show how versatile centre console boats can be!